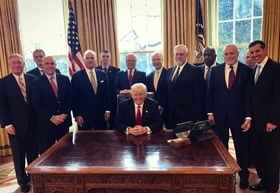 President Trump tweeted a photo after meeting Monday with CEOs of the insurance industry. After meeting with President Donald Trump at the White House early Monday, the CEOs of several large health insurers were optimistic about the future of the health insurance industry if the Affordable Care Act is repealed and replaced. The executives discussed plans to stabilize the individual insurance market. CEOs of Aetna, Anthem, Cigna Corp., Humana, UnitedHealth, Kaiser Permanente and several Blue Cross Blue Shield companies attended the meeting. Industry lobbying group America's Health Insurance Plans, was also in attendance. A Molina Healthcare spokeswoman said the Long Beach, Calif.-based insurer, which provided marketplace coverage to 526,000 people in 2016, was not invited to attend and did not know why. Molina lost $110 million from the plans it sold on the marketplaces in 2016. WellCare, which does not sell plans on the exchanges but has benefited from the Medicaid expansion under the ACA, also didn't attend. The handful of health insurance co-ops established by the ACA that have not yet folded were also not in attendance. The meeting offered health insurers a chance to discuss their concerns surrounding the future of the ACA and its replacement plan. Many insurers, including Anthem, Aetna and Molina, have said they can't commit to participating in the ACA exchanges in 2017 until they know what regulation will look like after the health care law is dismantled. During the meeting, Trump called the ACA's health insurance exchanges “disastrous,” adding that the market is “going to absolutely implode.” He said this would be a “catastrophic” year for the ACA, which has extended health insurance coverage to 20 million Americans. But, he assured them that a "fantastic" replacement plan is on the way that will lower costs and improve healthcare. The rest of the talk with insurers took place behind closed doors, but after the meeting, insurers said they were optimistic about the future of the healthcare landscape. "We're very glad to be with (Trump) today to hear that message and certainly willing and wanting to witness how this all will transition to a workable plan for the United States," Anthem CEO Joe Swedish told reporters after the meeting, CNN reported. “The Administration has taken several recent steps to demonstrate its commitment to a stable, effective transition that works for consumers, and we look forward to Congress taking additional, much-needed action soon,” AHIP said in a statement. The lobbying group said it discussed at the meeting ways to deliver short-term stability and long-term improvement in the insurance market. Insurers have been vocal about changes they hope to see to balance out and strengthen the individual market, which is dominated by members that are older, sicker and use more healthcare than insurers initially expected. The young, healthy members needed to stabilize the pool haven't shown up. So insurers—saddled with high medical claims— have raised insurance premiums to compensate. Some insurers, like Centene and Molina, have fared much better on the exchanges and are poised to break even. Even so, many of the major players in the marketplaces who have sustained millions in losses from those plans have warned that if they don't soon get the details they need to set 2018 premiums, they may reevaluate whether they will play ball. Others have already called it quits. Humana earlier this month announced it would no longer sell exchange plans next year. Aetna last month said it has no intention of re-entering the exchanges in any of the 11 states it exited earlier this year. UnitedHealth this year is selling exchange plans in just a handful of states, down from 34 states in 2016. Initially, insurers had until May 3 to file 2018 exchange plan applications and rates. But in a move to ease insurers' anxiety over the deadlines and prevent more from exiting the marketplace, the Trump administration last week moved that deadline back to June 21. The extension is a small gesture that doesn't do anything to resolve uncertainty in the long-term stability of the market, insurers said. The administration has also released a proposed rule meant to help stabilize the insurance market, but its small, short-term fixes failed to address most of the insurers' most pressing concerns. Insurers are asking for assurances that the GOP-controlled Congress will keep the individual mandate and premium subsidies in place. Molina's CEO told Modern Healthcare earlier this month that scrapping the ACA's cost-sharing reductions and premium subsidies that help people afford their health insurance plans would be a deal breaker for the insurer. They also want the administration to pay the more than $8 billion it owes them in risk corridor payments. The absence of those funds, meant to protect insurers from major losses during the first few years of the exchanges, has led to the failure of the co-ops and prompted several insurers to sue for payment.